Today I had the pleasure of visiting my lovely friend and her extra scrummy new baby girl. I wanted to take a present that was as sweet as her sweet baby, so yesterday I had a lovely afternoon concocting in the kitchen. I turned up the radio and made a LOT of mess. 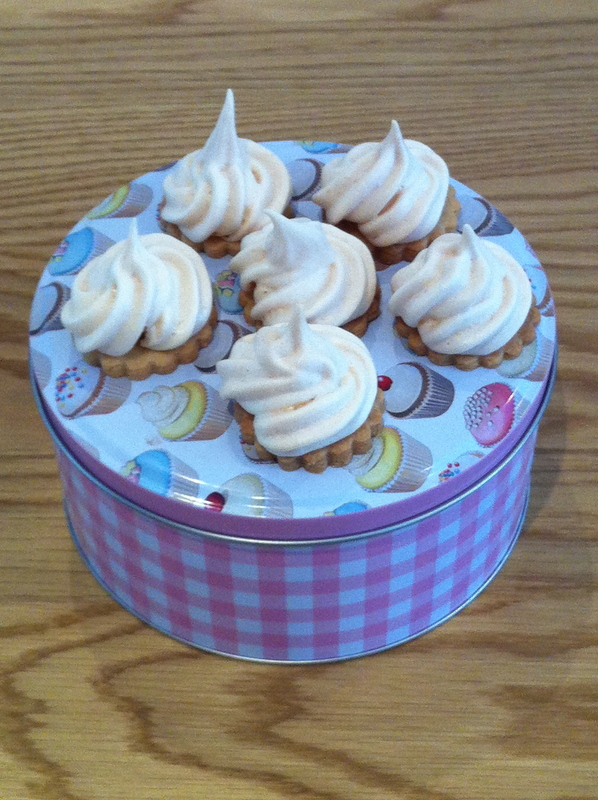 These little treats are based on Mr. Bandit’s love of lemon meringue pie. I wanted to find a small and pretty way of getting that taste without having to make a full-blown dessert. Whilst I’m a fan of the biscuit base for the pie version, these little mouthfuls needed something less crumbly, so I’ve gone for a shortbread base. Here’s what I did…. Sift the flour, almonds and icing sugar into a big bowl – big enough to get your hands into! Cut the butter into small cubes – it should be straight out the fridge and cold. Plop the cubed butter into the bowl and using your fingers start squidging the butter into the flour until you get a mixture like breadcrumbs. I find that rubbing the mix between my hands is very effective. Just make sure you’ve got really clean hands! Break up the egg yolk and then plop that into the bowl too. Use your hands to work the egg into the mix. It’ll form a dough quite quickly. Keep going until its smooth and forms a nice ball. Flatten the ball of dough a bit and wrap it in clingfilm. Pop it into the fridge for at least 30 minutes. Get the oven ready by heating it to 150 (for a fan oven, maybe a tad higher if you don’t have a fan oven). Once you have your shortbread chilled, you need to work quickly. As soon as it warms up it gets much harder to work with. Roll it out to about 1/3 to 1/2 a centimetre (not too thin or you won’t be able to get them onto the backing tray), and then use your cutter of choosing to cut them out. I used a fluted round 4cm cutter, but anything that will produce a similar size will work. You could even cut the dough into strips rather than circles. Place all your cut out pieces on a baking tray, on baking parchment, and then stab them all over with a fork (not too violently!). 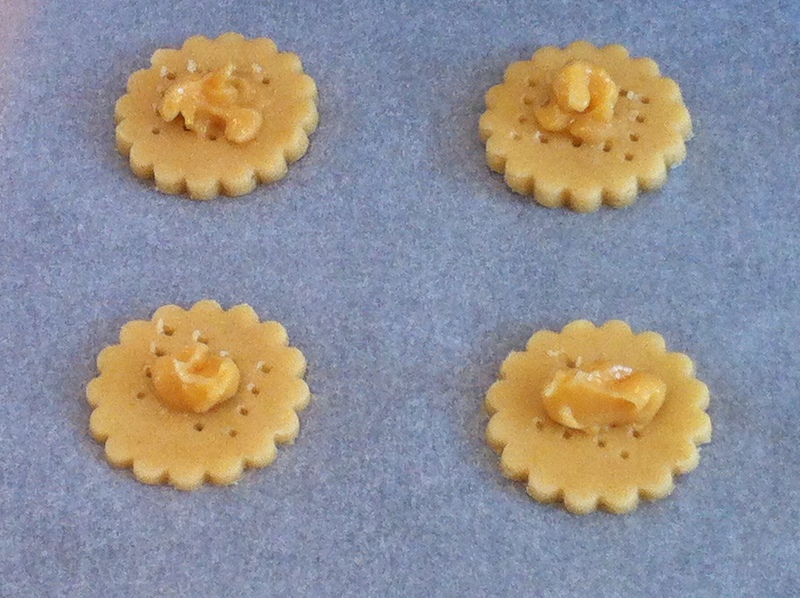 When you have all your cut out shortbread, get dolloping with the lemon curd. I made my own lemon curd (I’ll post the recipe for that too) but you can use a good quality bought one if you don’t fancy making it. The cheap stuff out of the squeezy bottles is no good because it runs, rather than sets, in the oven. You should have something like this…. Spread the lemon curd over the shortbread. This is what makes the meringue stick, so if you just leave it dolloped in the middle, the meringue ‘hats’ will come off. Be as generous as you like. I think I was a little mean with this batch – I’d up the lemon curd content next time. Meringue hats: whites from two eggs and 100g of caster sugar. Put the egg whites in a clean bowl that’s big enough to get a hand mixer or a whisk into. Whisk them until they form stiff peaks. Now SLOWLY add the sugar as you continue whisking, and keep going until the mixture goes all glossy and the peaks stiffen again (oo-er). Top Tip: don’t try and add the sugar before you’ve got the egg whites to stiff peak stage and don’t try and add the sugar all at once. Both of these things will leave you with a gooey mess that won’t stand up. What you do next all depends on how much of a faff you can be bothered with. I put the mixture into a piping bag with a large star-shaped nozzle and swirled the meringue onto the top of the shortbread. You could just snip the corner off a freezer bag and use that as a home-made piping bag (I’ve done it many times, its very effective) or you can use two teaspoons and put a blob of mixture on each shortbread. Put your little treats in the oven and leave to bake into wonderful goodness for 30 minutes. You should be left with something that looks a bit like this…. These would make a wonderful gift at any time of year, although they are particularly summery. The lemon could be swapped for all sorts of things, and if you have a favourite shortbread recipe, just use that instead. This recipe makes about 25 of these little beauties. They are quite delicate, so if you’re giving them away maybe put them in a small bowl and then wrap that in brown paper – looks lovely! I love these so much, I’m thinking about using them at the wedding….